The 6.5' Avenger Combo Alu Stand 20 with Leveling Leg is a short, black aluminum alloy, heavy duty light stand that features leveling leg with an adjustable extension that lengthens it to provide level support of equipment on uneven terrain and surfaces like stairs. The stand has 3 sections and 2 risers with a maximum height 6.5'. The stand has a combo 5/8" Baby top stud and 1 1/8" Junior receiver. Box Dimensions (LxWxH) 43.0 x 7.0 x 7.0"
Combo Alu Stand 20 with Leveling Leg (Black, 6.5') is rated 4.3 out of 5 by 3. Rated 3 out of 5 by boghav from Very small footprint, perhaps too small. As a heavy duty stand this unit has limited uses as the footprint is so small, that even at the limited height of this stand, I don't think that the leg spread is sufficient. Rated 5 out of 5 by TheDarce from Great compact stand I purchased this stand for a studio monitor mount and it has served me well. The stand is stable and low enough for good viewing angle. It's also very compact when folded up. Rated 5 out of 5 by Anonymous from Great Light Stand for Smaller Studios A great value for the money. Built like a tank. If my boys get into photography, I'm sure I'll be passing these onto them. They hold my Hensel Integra Pro monolights with any light modifier with ease. 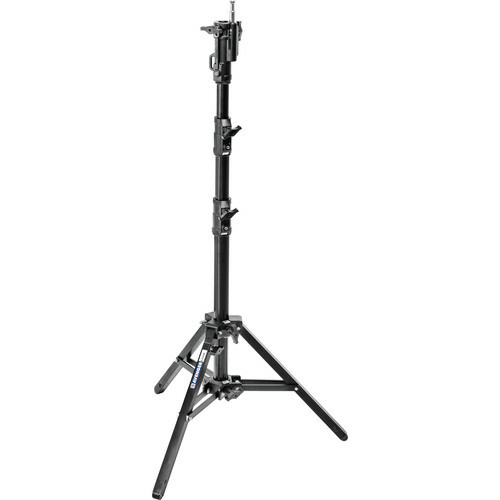 The Avenger A9000NB Wheel Set, B&amp;H # AVA9000NB will fit this stand.